Ferrari LaFerrari and Lamborghini aventador owned by Stanley Cohen and Roger. Ok everyone. Colby is in his 20's, but the cars are owned by his grandpa, Stanley. Sparkys real name is Roger, I hope you guys didn't think his real name was sparky lol! Thanks to everyone who said nice things. And izaac, nig. @W16 who's cars are they then? Ooh. One in yellow. How interesting. Can't wait to see more colors. Colby Paul is like a teenager. None of the cars are his although he acts like they all are because he's a top-notch jackass!!!11!!1!11! I thought the LaF was owned by Colby Paul. His instagram is colbypaulofficial, and the aventador is Sparkys I think. And its a CT license plate btw. Is that a Minnesota license plate on the LaF? I would take the Aventador over the LaFerrari. Nice combo! Great shot, so many great LaFerrari shots recently! This is for sure one of my favorites, L/F! @FanOfSupercars: Yes, and it's also the second one on the site. Awesome spot! 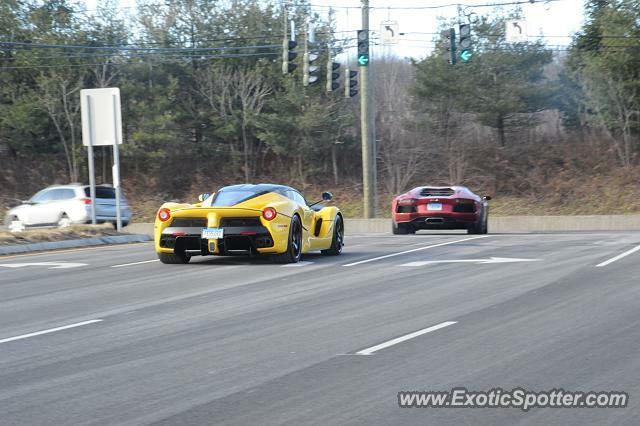 2nd yellow LaFerrari spotted in the US?